Do you really believe you can take care of others without taking care or yourself? Please think about this for a moment. Does it make sense to put yourself last (or never)? Remember the last flight you took. You were clearly instructed that if the oxygen masks drop down, you were to put the mask on yourself first, then on your dependents. Taking care of yourself first is the most practical and compassionate action you can take. In this culture, and perhaps especially in health care, it is also the most revolutionary action you can take. I know you are doing the best you can, and taking care of yourself may seem out of reach. It could be in the palm of your hand. Imagine, care for yourself, your patients/clients, and your loved ones, all in the palm of your hand. Imagine caring for yourself and someone else simultaneously. This reality is about 10 hours away. That’s how long it takes to learn to practice First degree Reiki. 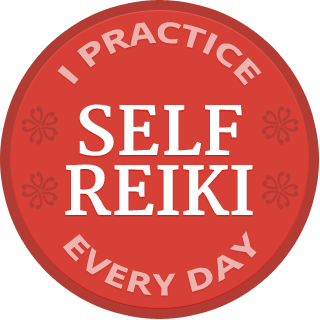 Once you are trained, you can practice Reiki self-treatment in bed, while you’re waking up, or falling asleep-or both. And you can easily integrate uplifting moments of Reiki touch into your routine care-uplifting for the person you take care of, and uplifting for you. Caring for others, professionally or at home, is a joyful calling that can also be very draining at times. Reiki will help you meet the challenge of communicating to your patients that you care on even the busiest workdays. Mary-Beth Charno, R.N., B.S.N., H.N.B.-B.C., O.C.N., N.P.-S. Thank you for the wonderful Reiki class you gave at Montefiore Medical Center. 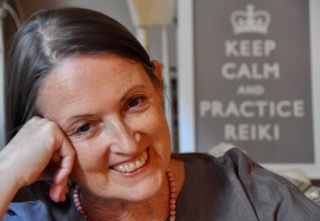 I have embraced Reiki in my life. The more I practice, the stronger I become. I have been having such great results, especially with infants and the very sick. Recently an 11 year-old patient with kidney failure received Reiki and felt so light and free from pain. When I practice Reiki, it seems easier to pick up patients, my young patients are easier to deal with, and parents are so pleased with the benefits. I have been a nurse for 28 years. I wish I had had the opportunity to learn Reiki sooner. Thank you again. See the calendar for dates of upcoming First degree Reiki classes, or email me to discuss arranging a class at your place of business. Signup for my email list and specify that you are a healthcare professional. Papers published in peer-reviewed medical journals are available at Medical Papers. Reiki Treatment Helps Heart Attack Patients discusses research done at Yale on the effects of Reiki treatment on heart rate variability (HRV) and mood. This is a basic study that is applicable to many populations and which could be replicated in other settings. I wrote the Reiki module for Taking Charge of Your Health, the consumer health website of the Center for Spirituality and Healing at the University of Minnesota. It is peer-reviewed and a useful resource for both healthcare professionals and the people entrusted to their care. You’ll find a recording of a Reiki presentation I gave at a medical conference at Reiki Medical Presentation. I am available to present or teach Reiki at your institution or professional conference, and to help you organize an onsite Reiki program to serve patients, families, and staff with documented treatments.